This page is currently in blog format as it is just my research notes for the project. Spindles are hard to build properly, which is why they are so expensive. You can use a 3 phase input VFD, and power it off of single phase. You just need to derate the VFD by a factor of 1.73 to account for only a single phase of power. Or to put it in more useful terms, you need to buy a more powerful VFD to accommodate your 5 HP motor, using the formula of (5 HP)* 1.73 = 8.7 HP. This doesn’t mean you are drawing 8.7HP worth of current. The current max current draw off of 230 V single phase for this inverter is approx I=(5 HP)*(746W/HP)/(230V * 0.85 * 0.85)= 22A (last two 0.85 factors account for the inefficiency of the motor and the VFD). Powering 5 HP off a single phase 230V circuit is doable, and since the VFD is acting as a soft-starter, and limiting the starting surge, it is much less problematic than powering a 5HP cap start-run straight off the same circuit. This is a common practice, and the VFD manufacturers usually provide instructions about doing this. My newer inverter welding machine is connedted like that too, you just use the two 230 single phase leads and leave the third lead unconnected that would be used for three phase, it is derated some though. There’s a formula to get the cc’s of lube, it is the last to digits of the bearing number x 5 x .06. This will give you the amount of cc’s per bearing. 08 x 5 x .06 = 2.4 cc’s of lube. Saw the Teco 7300CV written up in a CNCZone thread. Several of the long-time posters like the drive and it is a sensorless vector which is what I’d prefer (broad torque band to reduce the need for belt changing). This seemed like a nice setup from Kelling if 3HP is enough. Unfortunately, the later threads I’ve read indicate the controller is not reliable and there are some questions about whether it really produces 3 HP. I’ll leave this in here so people can find it, but I’ve gone back to thinking about a more traditional VFD setup. The rpm range is 400 – 6000 rpm. The controller is PWM-ready, so is easily interfaced to Mach3. There is also a charge pump/E-Stop input. The motor is a brushless DC, so it should last a good long time. The power supply is integral so you can plug it into either 110 or 220, and there is even a nifty LCD tachometer that shows the RPM. Judging from the video, it isn’t real fast on acceleration, but it isn’t terrible either–about 6 seconds to ramp the entire range from S400 to S6000. You’ll definitely want to think about using a G4 Dwell in your g-code though. 3HP is not too bad. I had to cannibalize my 3HP VFD I had bought for the mill so I could run my big bandsaw, so I will need to be in the market for something else. This would definitely be another setup to consider instead of a VFD + AC motor. It’d be cool to have one with both an “Aluminum” and a “Steel” speed range. The Steel would gear down the 400-6000 rpm range to maybe 100-1500 rpm, while the Aluminum would go the other way for a range of maybe 550-8000 rpm. That Steel range might be too low, so a 1:2 ratio would give 200-3000 rpm. I need to play with it on G-Wizard to see what ranges I’d favor. There are some issues if you read on in the CNCZone thread. Also, it appears that $229 will not buy you both the motor and controller. Maybe not as godo a setup as it seemed. Back to sensorless vector drives for me! 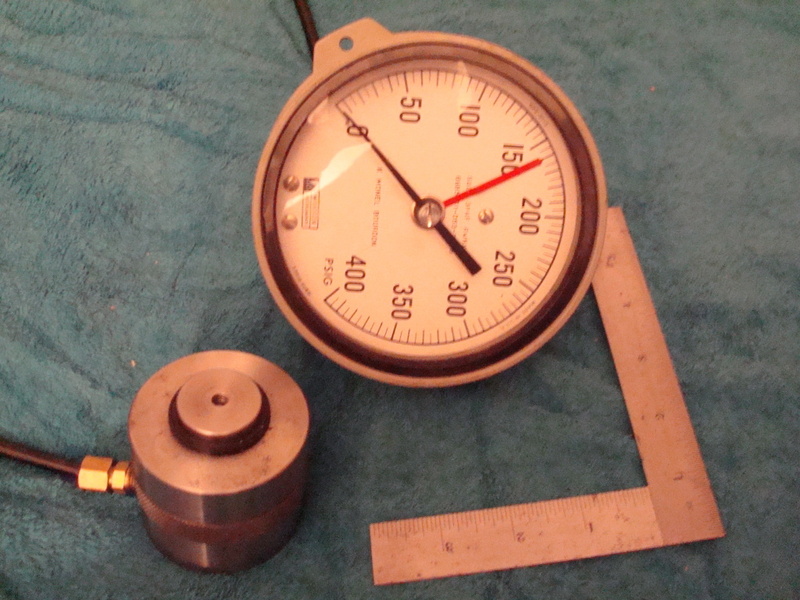 The idea is to use the scale with a test cell to measure the displacement of the bearing inner race when the appropriate preload is attained. Once that has been determined, spacers can be machined that deliver the same displacement and hence the same preload. There is some good discussion about this on the PM boards. The stiffness of the spindle goes up as the fourth power of the wall thickness according to some information I saw in one of the bearing catalogs. That means you want the largest possible bearings you can afford because a small increase in the thickness makes for a much stiffer spindle. A Mazak QT-20 lathe runs 120mm ID bearings on the spindle and has a spindle bore of 2.44″. That works out to a wall thickness of about 1.142″ or about 29mm. 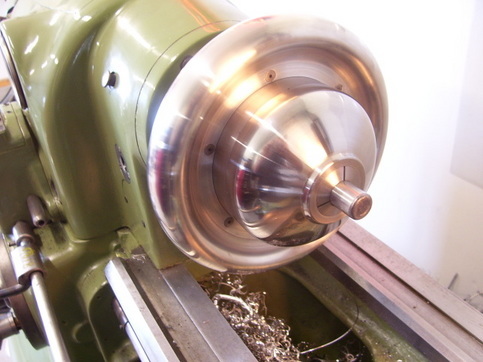 Now let’s say we want to build a lathe spindle with a spindle bore of 2″. Let’s give it a 1″ wall thickness, so we need bearings with 4″ ID which is 101mm. Since bearings come in 5mm ID increments, we can look at a 100mm or 105mm ID, which would be a 7220 or a 7221 angular contact bearing. Brand new Nachi 7220 CYDUP4 bearings are $1351 each and you need 2 of them. Ouch! I can see some others on eBay such as an SKF 7221 BECCM for $249.99. Better, but still painful for an experimental spindle project. I finally tracked down some real information on how to set angular contact bearing preload via spacers on the SKF web site. Okay, let’s work an example. Let’s say I have a pair of 7207 CD bearings that I want to preload. The minimum spacer size difference I might use is a, which is 9 micrometers. That’s 0.009 mm or 0.00035″. The largest displacement I might use would be a+b = 21 micrometers = 0.00083″. Pretty small spacer size difference! – Going from A to B increases preload 60N, and requires a 0.00035″ spacer. – Going from B to C increases preload 120N, and requires a 0.00047″ spacer. – Going from A to C increases preload 180N, and requires a 0.00083″ spacer. We can extrapolate that to go from no-preload (i.e. we bought raw bearings that are not ground for preload) to the class C preload (i.e. 240N preload) might take something on the order of 0.00118″ or a tiny bit more. The spacer rings should be made of highgrade steel that can be hardened to between 45 and 60 HRC, depending on the application. 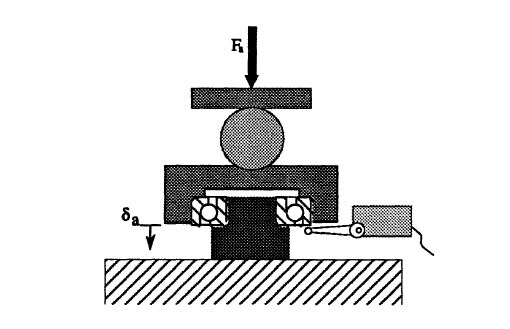 Particular importance must be given to the plane parallelism of the face surfaces, where the permissible shape deviation must not exceed 1 to 2 µm. 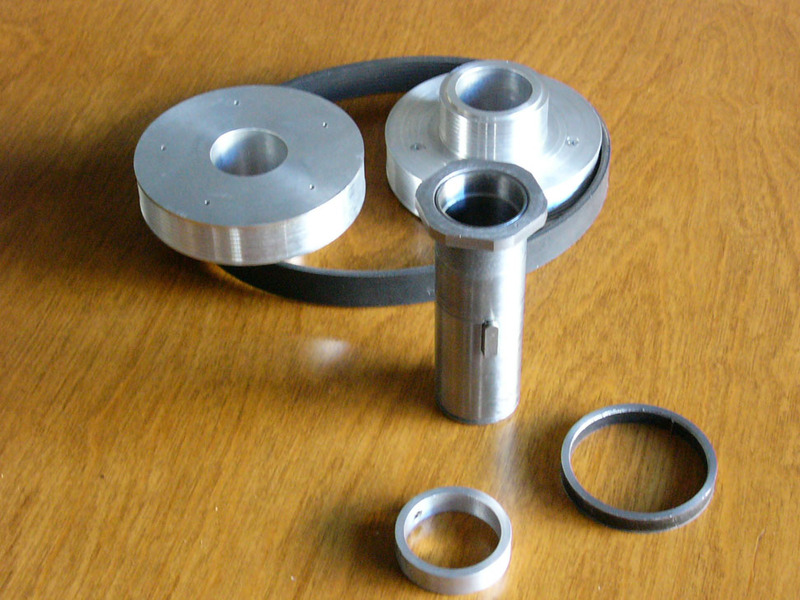 The overall width of the inner and outer spacer rings should be identical. The most accurate way to do this is to process the width of the concentric inner and outer spacer rings in one operation. Making the rings to the requisite accuracy is definitely a grinding operation since we’re measuring progress in tenths. These rings are not going to be very wide either. Let’s say not more than the width of the bearing itself. We will mount the pair of bearings on the spindle nose against a shoulder on the spindle. The inner race spacer will go between the bearings as will the outer race spacer. 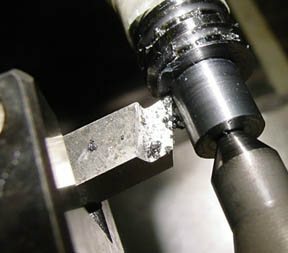 A precision nut will thread onto the spindle nose and down onto the inner race of the bearing stack to hold it in place. The nut is precision simply because it has been faced so that the surface against the bearings is flat. If you scan way down this page you’ll see my write up about oil lubrication of spindle bearings and the chart that shows bearing rpms versus the dN. Really good bearing grease can achieve a much higher dN than the wheel bearing grease you were tempted to use from the auto part store around the corner. The best spindle greases come from a company called Kluber. The trick is finding the stuff in small quantities without breaking the bank. There are a variety of grades available. Update: Ordered a tube of my own from Kluber NA on April 27. Interesting, if true, because that’s a pretty cheap sensorless vector drive. Looking through the manual, it does have provision for a PID feedback loop and an index sensor. Atrump is using Delta drives too, although they use the more expensive closed loop VFD-VE series. A nice 3 HP is going to be $553.80 from one supplier I found. Looks pretty easy to set one up to index for a toolchanger. According to the Atrump site, you just enter the encoder count in the VFD when things are lined up right. Hitachi SJ300 + SJ-FD Board = Spindle Servo Drive? 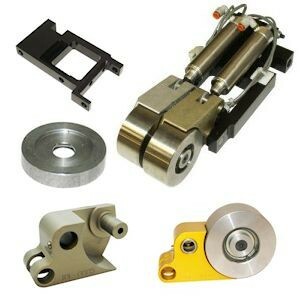 Suppose you want to build a toolchanger that requires spindle orientation. While we’re add it, let’s do rigid tapping. And let’s require an extremely broad torque range for the spindle to minimize the need for any gear changes. That’s a hard task, but I’m starting to think the Hitachi SJ300 with the optional SJ-FD encoder board might do the trick. The SJ-FD, in particular, looks like it provides something called “pulse train mode”, which looks suspiciously like step/dir control. The whole thing is not cheap, and requires 3 phase power input to boot. if it is a fairly ordinary motor with a fancy drive). That’s one approach, but not cheap. Try looking for a 2 or 3 HP servo drive and motor! 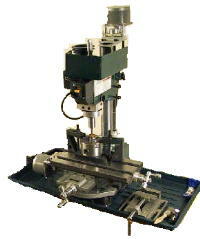 Another thought is to use a smaller stepper that can be disengaged to index the spindle for tool changes. You want to disengage it because if it’s driven all the time it wears out the stepper and it generates back EMF that will fry the servo drive. At the least you need to electronically disengage it. Now let’s say we have an impact wrench style powered drawbar or an air cylinder that compresses a Belleville spring stack. Either way, there is a downward motion. We use that downward motion to push a roller equipped assembly against the cam. The roller will then turn the spindle until the roller is at its lower point, which should line up the indexing for the drive tangs. paper by Reliance Electric that indicated you could expect a 2:1 range for a regular VFD, and a 4:1 range with a vector drive. In other words, run your motor at up to half speed without losing torque with a normal VFD, and 1/4 speed with a vector drive. Why does this matter? Because the speed range you need to cover the gamut of machining tough steels all the way up to aluminum and soft materials is huge. To span a range of 100 rpm all the way to 8000 rpm (still nowhere close to what a lot of CNC’s run today) takes an 80:1 range! That’s why you need gear changes, back gears, step pulleys, variable pitch pulleys, or a host of other mechanical transmissions used on different machine tools. But those transmissions are a hassle to deal with too, especially if you want to build your own machine, or radically alter the performance envelope of you spindle. So it was with some interest that I came across a Sumitomo Vector Drive spec. I guess a good vector drive these days has more range than Reliance gives them credit for. A sensorless drive is one you could just hook up like any VFD, and Sumitomo claims a range of 120:1 for their HF-430 unit in sensorless mode and that with a speed accuracy of 0.5%. But it gets even better. Add the encoder board and put a suitable encoder on the motor and now they’re claiming a range of 1000:1 and speed accuracy of 0.05%! That’s starting to be quite a range, and these drives have gotten a lot cheaper over time. I came across this particular one in an eBay buy it now for $249 for a 3 HP unit. The only thing missing from it seems to be true servo operation, or at least a means of parking the spindle at a known location. True servo operation would allow the spindle to be indexed to any arbitrary position. You can imagine that would be handy if you wanted to set up your lathe spindle with a 3 HP motor (or more) and treat it as a C-axis. Index to a location, put an air powered spindle on your CNC gang slide, and you can suddenly drill a bolt circle for a flange under CNC power. A parking position would make implementing a tool changer for a mill a lot more feasible. Park the spindle in a known location and the “dogs” on the toolholder are properly lined up. Could be a source of cheap parts. Check this Gates article. Downloaded a set of manuals for a Fadal 4020. It’s amazing what you can learn from these. There are exploded diagrams and detailed maintenance procedures. The two things that interested me most were the details of how the toolchanger works, and the details of how the 2-speed transmission for the spindle works. The latter is particularly intriguing for this belt driven spindle project. I can’t quite fathom all the details from the drawings and pictures, so I posted a question on CNCZone on a likely Fadal thread I found. If what I suspect is true, it would be a slick way of building a 2-speed transmission to extend the speed range beyond what a VFD will comfortably deliver. Hopefully the gang on the ‘Zone will fill in my blanks. Here is a picture of the idler assembly, $800 to buy one! The system has 2:1 pulleys on the motor and the spindle. There is a ribbed belt on each, a 315K10 if that matters. Node the ridges, and the way the top belt has a shelf to support it. 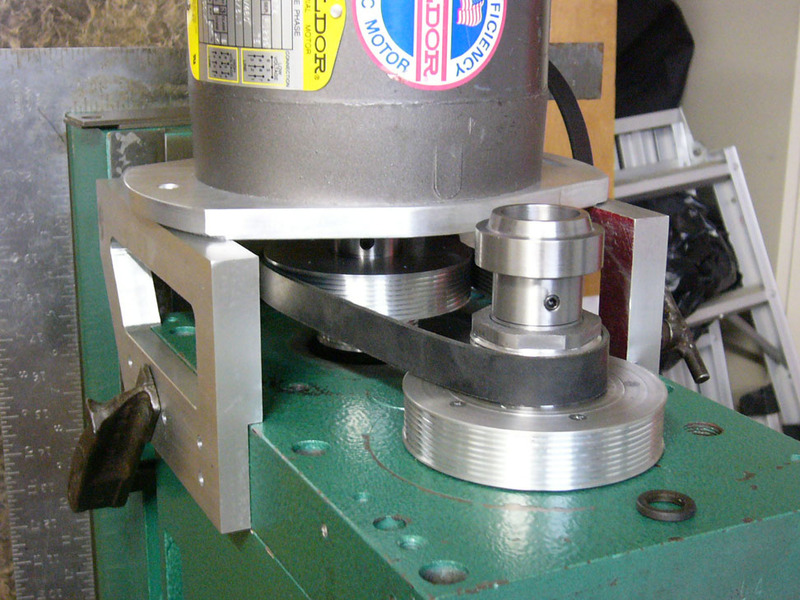 The ridges allow a little bit of belt slippage without too much surface area for the belt that is disengaged. Not too hard to imagine the bottom belt just sitting there quietly. If tension is removed, it will flex out and not be driven. In addition, it is held slightly out of the way by gravity. Given the ratios available, the “hi” gear will drive the spindle at 2x motor speed and the “lo” gear will drive it at 1/2 motor speed. Couple that with a 3600 rpm motor and you should have a range that extends from a hundred rpm all the way to 7,200 rpm. If you can overspeed the motor safely, you can get to the magic 10,000 rpm number. The Fadal-style transmission is also relatively compact. It seems an ideal addition to the project if I can figure it out. 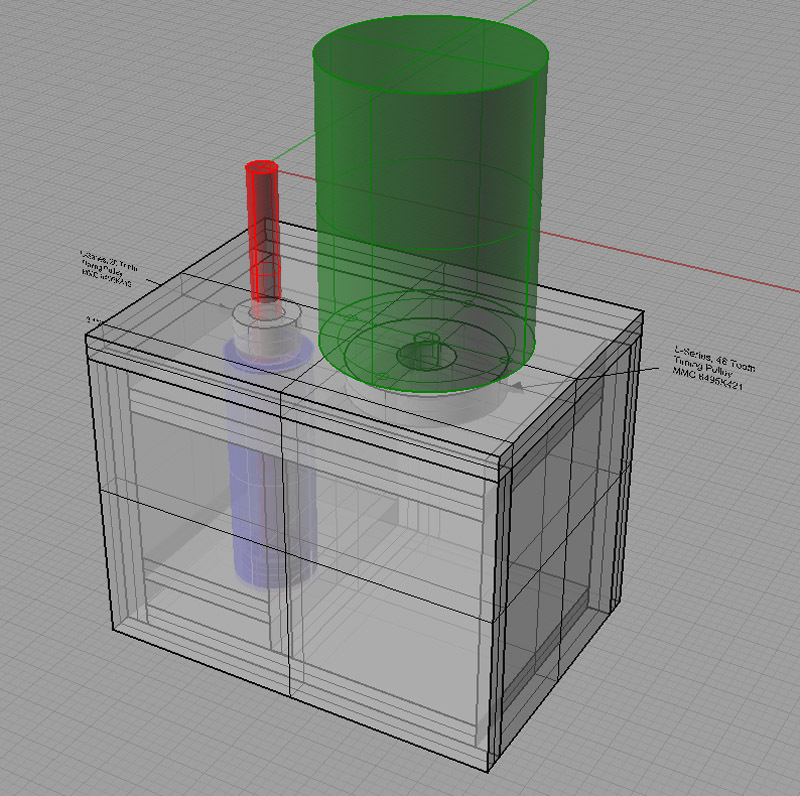 I might even build a manually operated prototype and look into air cylinders later. Another Belt Drive for the IH Mill is in the Offing! What ho! The game is afoot! existing dovetail slide to cut a bed for his linear slides. Cool! Go check out the CNCZone thread for full details! My conclusion on this is that a back gear of some kind is needed for low speed operation. There’s just too much loss of torque at low speeds if you try to run belts directly with no ability to change gear ratios. One could use something as simple as cone pulleys to provide different rations, or something more complex like the variable pitch pulleys I have discussed below. Another idea is to use a much bigger motor, so that the torque drop off is less noticeable. For example, these mills start out at 2 HP. A 5HP motor should notionally be able to run at 1/4 rpm and have the torque of a 2 HP. – The motor will deliver full horsepower down to 1/2 speed. – Below 1/2 speed, HP falls off in direct proportion to how far the rpm is from rated speed. – You can’t run the motor over its rated speed. I’ve experimented with drive ratios, which are listed along the top 2 rows, as well as motor horsepower, listed right below. The numbers in the sheet are “estimated horsepower”. They’re likely bogus as exact horsepower figures, but helpful as a guideline. If I had less than 0.2 horsepower, I marked that off in pink as being unusable. If I had less than 0.5 horsepower, it is marked yellow–probably usable if you go slow with a cutter that won’t take much horsepower. To give an idea of some high horsepower operations, I played with a Feeds and Speeds Calculator and came up with big twist drills (always use lots of power) and a 4″ indexable face mill. 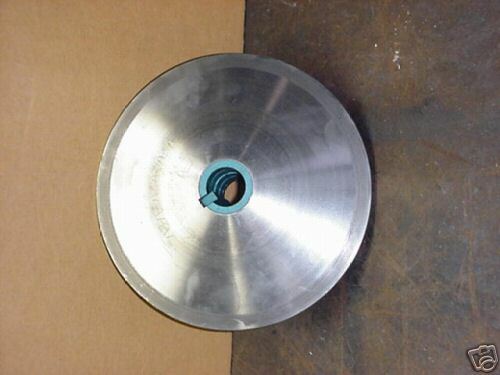 When cutting tool steel, they need 1.2HP. This just to give some “worst case” checks. – Bumping up to 5 horsepower doesn’t buy you a lot more speed range. It’s pretty similar (not surprisingly) to a 2:1 back gear. – A 2:1 back gear is essential for lower horsepower motors just to survive with steel. 5 HP with a 2:1 back gear gets you all the way down to 100 rpm. – 5:1 back gear is too wide a spread with a 2 HP motor. You’d have a dead zone from 800 – 1500 rpm. – 3:1 back gear 2HP looks about right to me. I like the use of a variable pitch pulley for system for back gear. Hey, if it was good enough for Bridgeport, its good enough for me! 8K spindle (which I’m aiming for), you’d need 4.8:1. I’d run the system with preset stops. Probably 3 stops on the range is good, and use the VFD to fine control speeds within a stop. A 2-stage system could use a 2:1 back gear and a 3:1 varispeed to get up to a 6:1 advantage, for real power down low. Some kind of tumbler system like the lathe guys use could work for the back gear shift. An alternate gear train option would be a planetary gear set for low speed operation. Available on Google, search for patent #3330634. It seems most of the time that preload is going to be specified as pounds. For example, NCCams claims that 150lbs for a pair (75 lbs each) is the proper minimum loading for angular contact bearings holding a ballscrew. I keep trying to envision how to go about getting the bearings ground for that sort of preload. 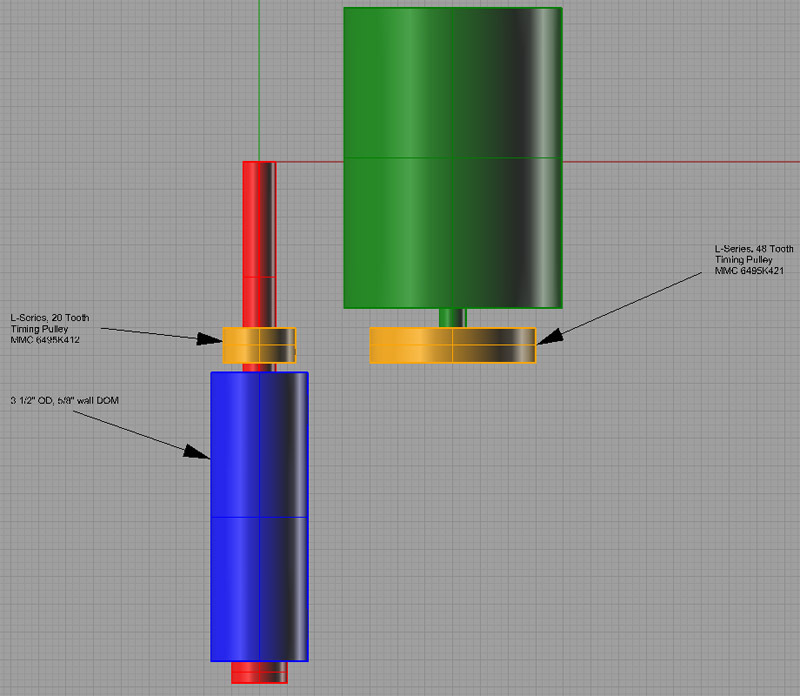 I presented my load cell idea below, but here is another idea. them up by whatever amount the 75 lbs manages. Before use, the fixture is calibrated by placing the desired preload weight atop the anvil and screwing in the cap screw until the weight is just lifted up. Once calibrated, a bearing is placed on the anvil, and the slotted top piece is bolted down onto the fixture to hold the outer races flat against the surface of the fixture. A small section of the bearing’s inner races will protrude. 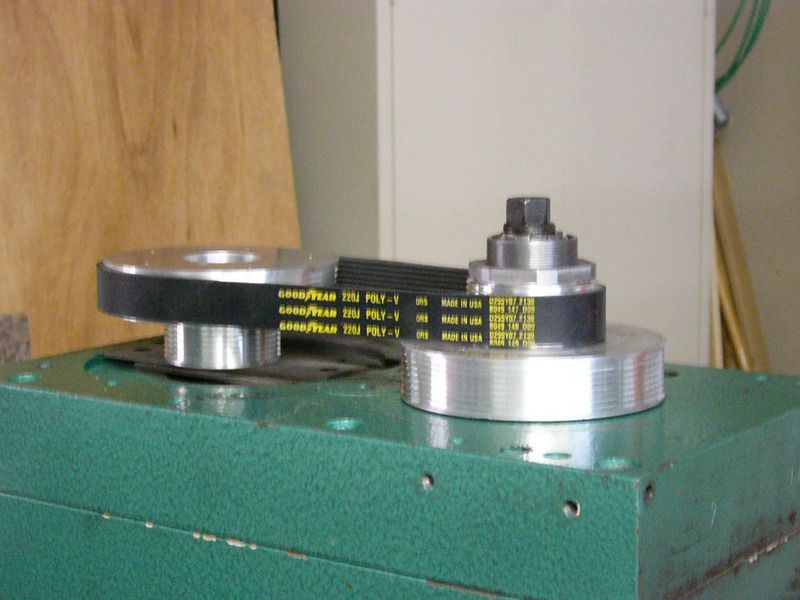 The fixture with bearing needs to be run through a surface grinder until it “sparks out” against the outer races, indicating that the inner races are now flush despite the preload. 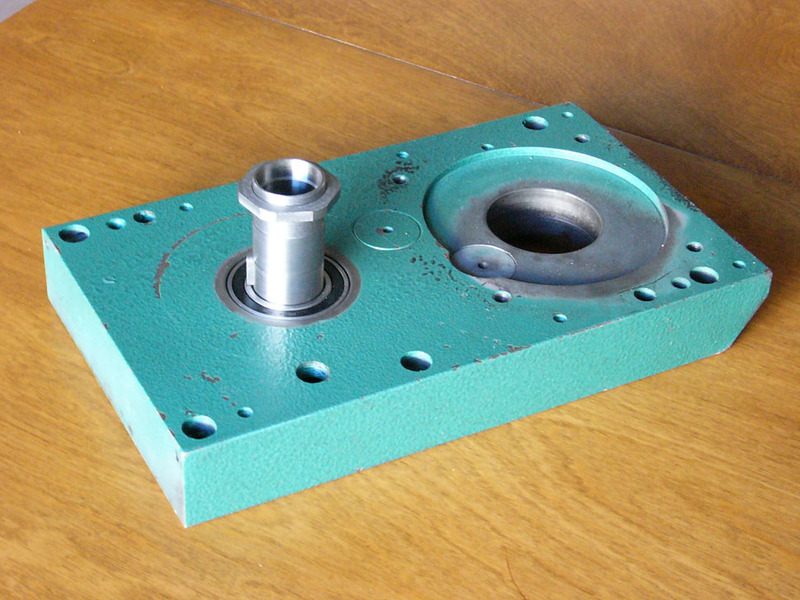 If the fixture were to be used a lot, various sizes of cap and top anvil could be made up to suit different bearing sizes. The only requirement is that the anvil not contact the area very much outside the inner races, and the cap be made to only hold down the outer races and provide access to the inners. I designed this fixture to be largely made on the lathe because that’s where I think most will get their greatest accuracy. 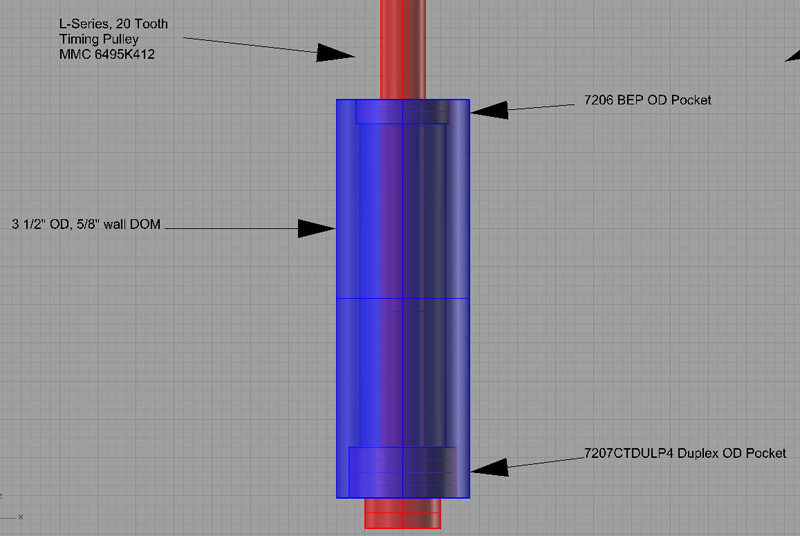 For best precision it seems to me the top and bottom of the cap as well as the top and bottom of the fixture’s main barrel should also be ground flat and parallel. 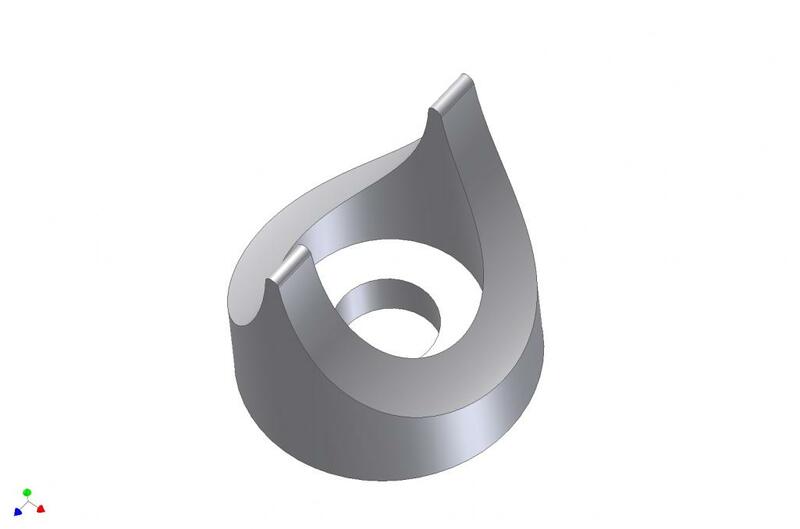 The slot in the cap need not be precision, and can simply be milled out. Slocum’s Precision Machine Design book describes a method very similar to this for grinding angular contact bearings for preload. 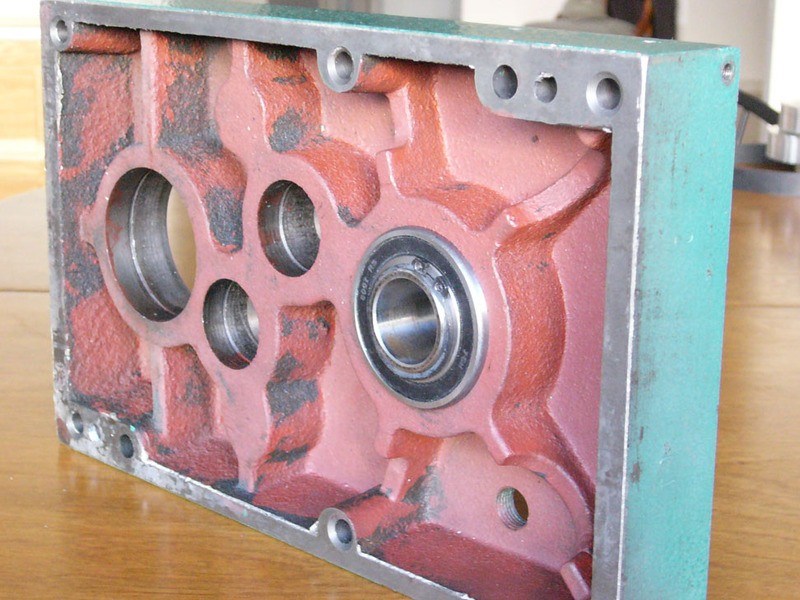 Without ball bearings of various types, machine tools would be impossible. Their most critical applications involve ballscrew mounting and spindles. Unfortunately, these very same critical applications often call out for very expensive bearings that are out of reach for hobby class machine work. I have a confession to make: I harbor a deep resentment for those expensive “machine tool quality” angular contact bearings. It may be an unreasonable resentment from some perspectives. NCCams over on CNCZone will tell you all day long that you get what you pay for and you have to buy the most expensive bearings you can’t afford, but my resentment leads me to wonder whether it is all really necessary. Yes, if I’m building a vertical machining center with micron accuracy that’s capable of 600 ipm rapids, I’m sure they’re necessary. NCCams has built a precision machine used to make camshafts for NASCAR winning seems, surely a very exacting application, and one that needed great bearings. block on a machine I hope will be repeatable to a thousandth? I feel the resentment is reasonable for the hobby machines. Someone needs to speak for them! There are tantalizing clues about this conundrum that I run across from time to time, and it always perks up my interest. – I am told by various sources that garden variety bearings of today are every bit as accurate as the machine tool quality bearings of the 40’s and 50’s. – Many Asian-built machines such as the Tormach mills do not use ABEC7 bearings, they get by on lesser grades. – See my notes on the belt drive page about how to go about hand fitting unmatched bearing pairs to be preloaded duplex pairs. – I constantly see examples where machinists are able to get superior performance from worn out or inferior machinery because they know the right tricks. Why can’t that be true here too? ones would do? I can think of several reasons. First, look at it from the standpoint of manufacturing repeatability. Machine tools have to be warranted to certain performance levels despite variations in their construction and component parts. Tightening up the specs on the components makes it less likely the tolerances will stack up poorly and a machine will leave the line that isn’t up to specs. The science of Six Sigmas and quality control will tell you it is cheaper to set up the manufacturing process to avoid these mistakes in the first place rather than find them after the machines are built and have to rework the out of spec machines. So the overall cost to mass produce a machine may be less while the individual cost of a single machine may be more. the warranty cost of a failure is very expensive to cure. The cost to an individual to fix their hobby machine themselves may be so much lower they’re much more willing to risk it. I read somewhere on CNCZone of a fellow running a CNC router shop that uses hardware store routers and buys crates of bearings for them. He says it costs about $2.50 to replace each bearing and he gets 100 hours of continuous routing from a bearing. To him it is worth it to keep on replacing cheap bearings. To Haas, who sold you a very much more expensive gantry router and a warranty that causes them to have to send someone out to fix your bearings if they break, it isn’t worth it. Lastly, there is a labor intensiveness factor that matters more to the manufacturer and less to the hobbyist (or to the Asian manufacturer for that matter!). If I am a hobbyist, I can take the time needed to take two relatively unmatched angular contact bearings and grind them for a desired preload. I can then hand fit them to the shafts and bores they’ll live in, lapping, honing, or using whatever means is necessary to achieve a good result. If an experiment of this kind is marginal or fails, I can always try again and perhaps do better the second time. Most of the investment I have in is just time. OTOH, if I am a manufacturer, unless my labor is extremely cheap, I want no part of that process. I will spend quite a bit of premium to buy a matched pair of preloaded AC bearings off the shelf so I don’t have to mess with grinding them and trial and error. A really fancy set of these bearings is maybe $800. It takes surprisingly little shop time for someone to run up $800 of labor, and they may screw it up! If I just buy the bearings, they’re guaranteed and someone else takes the risk for the screw ups. Hence I just buy the bearings if I’m a manufacturer. Things were not always this way. Bridgeport used to hand fit spindle bearings, for example. Not because it made a better mill, but because it was cheaper than buying more expensive bearings at the labor rates in those days. I CNC. He got on the phone to Bridgeport at the suggestion of one member, and was told that each axis would cost $650 to $875 just for the bearings. OUCH!!! He probably paid less than the cost of the 3 sets of bearings for the whole machine! make the screw stiff and there will be a tradeoff between less play and too much stiffness). 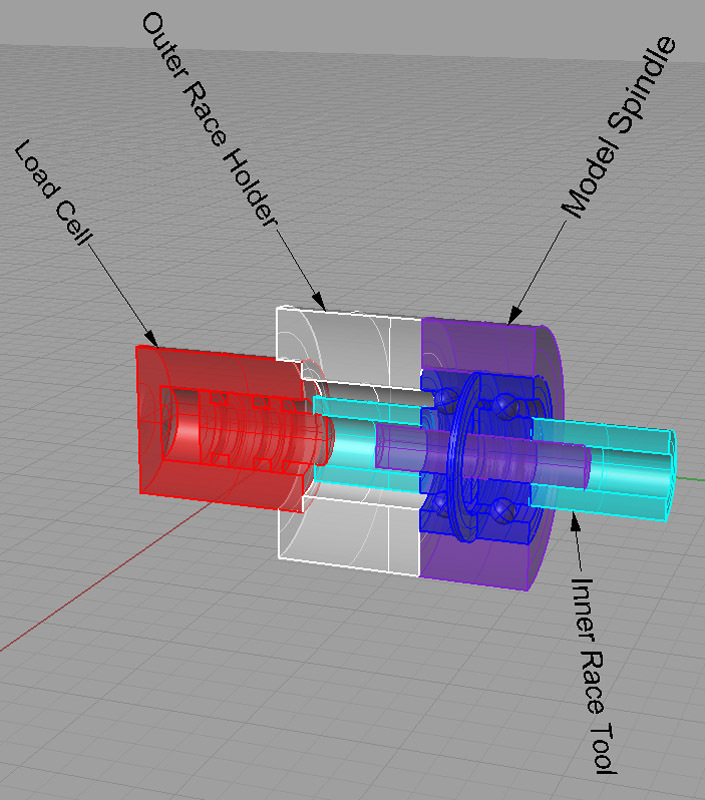 Backlash of 0.0008″ would be fine for hobbyists wanting to machine with 0.001″ accuracy. The price is right and a small amount of labor delivered this happy ending. Would a manufacturer do it this way? They probably would in China, but not from one of the “big name” machine builders they wouldn’t! Any casual reader of CNCZone will eventually run across one of the famous bearing rants for either spindles or ballscrew mounting. Closely allied are the drill press mill rants. Some noob will inquire with much enthusiasm how to go about converting the Asian drill press they just got for $39.95 into a CNC mill capable of slicing through solid green kyrptonite at 300 ipm with an accuracy of 10 microns and the old hands will just come unglued at the absurdity of it all. While this can be entirely entertaining to watch, one does feel a bit like the beginners are receiving an initiation flogging they don’t really deserve and are ill-equipped to understand. The bearing question is similar. Someone wants to mount a ballscrew or spindle in “ABEC7” skate bearings that were purchased cheaply on eBay and the ranting from the old hands starts in again. Pretty soon the fur is flying and we’re talking about the need for $800 20TAC47 bearings on an Asian mill that didn’t cost that much more than that and everyone wonders how we got there. he had installed 5 deep groove ball bearings and a single tapered bearing that was in backwards of all things. You just can’t do that–it ain’t right! “Hmmm,” says I. When I hear that you can’t do something, I kind of want to know why the guy did it anyway and how well it worked. It occured to me that perhaps this guy was clever like a fox. I sniffed around his site a bit more and learned he was a Professor of Mechanical Engineering with full Piled Higher and Deeper credentials. Now I am not one who is intimidated by credentials having attended graduate school and met many of these sort of fellows. At the same time I do not immediately assume any PhD is an idiot either. This guy piled on 5 deep groove and 1 upside down tapered roller bearing for a reason, and it became my mission to figure it out. It didn’t take me too long to decide that maybe he was just stacking the bearings to make up for their inherent weaknesses. 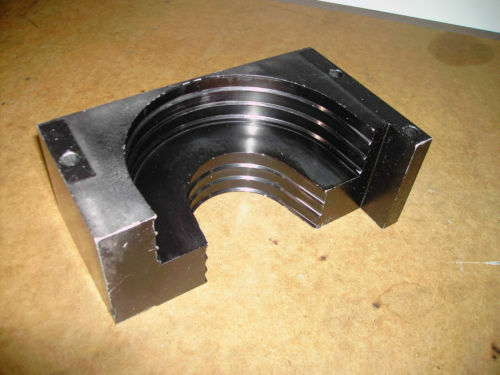 One often hears about stacking 3 or even 4 angular contact bearings to increase rigidity. So I dragged out my bearing catalogs and had a look at what this might mean. 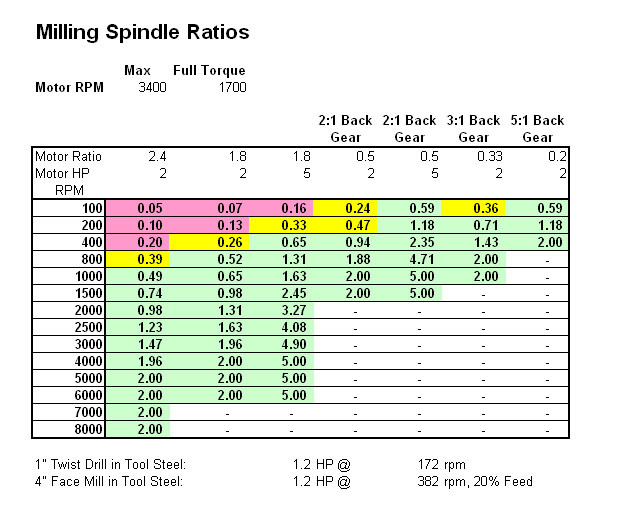 You can see that axial loads are additive but radial loads don’t get 4x the value when you stack 4 bearings. In fact they aren’t even 3x as strong radially when 4 bearings are stacked. That’s going to be the weakpoint I suspect. The results are interesting. screw moving along its axis and introducing backlash. So how do they compare to equivalent angular contact bearings? The plain vanilla angular contact equivalent of a 6204 is simply a 7204. Your basic 7204 costs $23.88 so already we could have bought 3 6204’s for the price of a single 7204 and for two 7204’s we can surely stack up our 4 6204’s. A matched duplex pair of ABEC7 7204’s are a cool $200. the duplex AC bearings are still a bit cheaper, but if we’re fooling with ore “stock” bearings, it seems like we can get a more rigid arrangement for less money using the deep groove bearings. I’m sure it is probably not quite so easy, but it is certainly intriguing. It wouldn’t cost much to build a test rig and see how well the deep grooves perform when stacked. Now I’m sure the bearing gurus are spinning up to full whirling dervish speed to jump all over this concept, but I remain unrepentant until I see someone hook them up and make them play. What about the really expensive bearings? load value of 26,600N. That’s better than 3 stacked 7204’s! However, note that the quadruple 6204’s begins to approach this value at 26,400N. 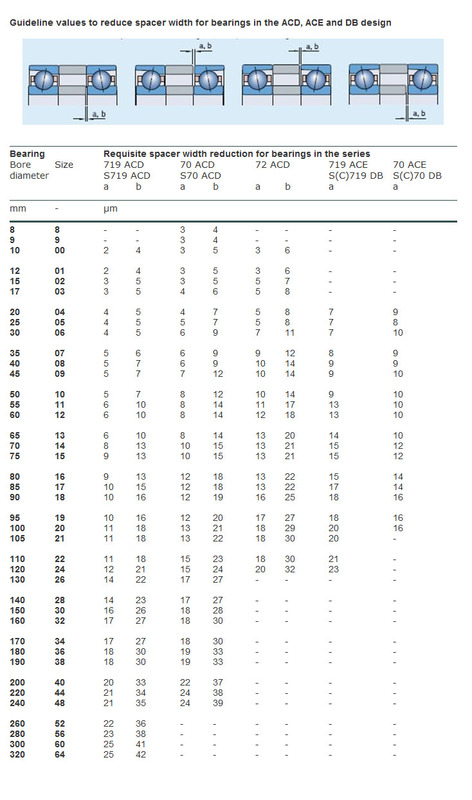 Also note that 20TAC47B’s cost $800 the pair. It remains to be seen, but I would sure love to try the experiment someday! rpms. 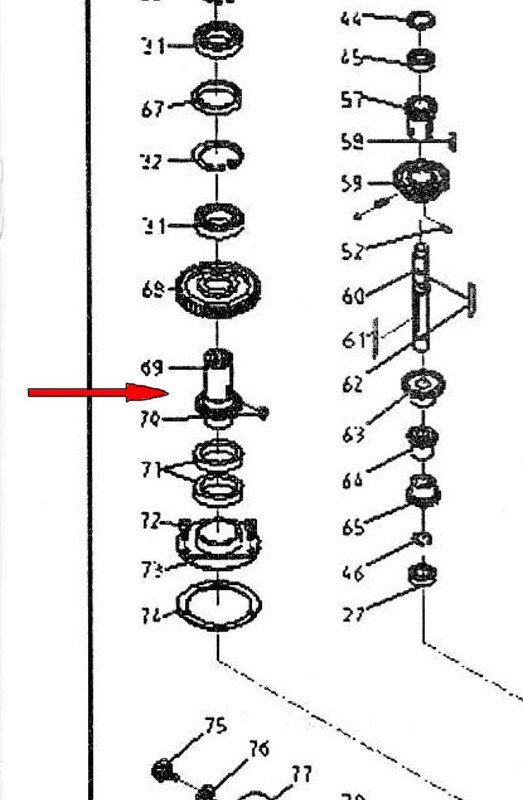 One of the mechanisms used to effect these differing ratios is the classic cone pulley arrangement. This is painful because it requires a manual operation to swap the belt over to a different ratio. so popular for lathes. If this is done, one would thing the ideal thing is to have the gears driven directly from the motor such that the output of the tumbler gears is either 1:1 the motor’s speed or 1/2 the motor’s speed. This would then be multiplied via belt pulleys to get to the desired maximum spindle rpm. For example, let’s say we have a 1500 rpm motor and we want to run at a maximum of 8000 rpm on the spindle. This calls for a 5.3:1 pulley ratio driving the spindle. If the back gear runs the motor at 1/2 speed, we would have 2 ranges: 0 to 4000 rpm and 4000 to 8000 rpm. So even when we run the spindle at 100 rpm, our motor is running at 100/5.3 * 2 or about 38 rpm. If the back gear had a 3:1 ratio, at 100 rpm we’d be running 56 rpm whereas at 8000 rpm we’d still be running 1500 rpm on our motor. well enough to be sure my design would work well or to debug it if it didn’t. I am probably better off to try to acquire one. 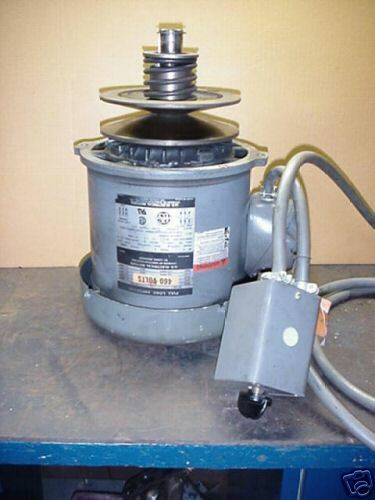 Variable pitch pulleys are available commercially from places like Lovejoy, but they do not look cheap. Interestingly, they are also available from the go kart industry where they’re referred to as “torque converters” and are much cheaper. The go kart variety cost circa $60 to 70 for a 3-5 HP capable pulley system capable of giving a 3:1 range. One difference is that the go kart system changes its ratio based on the speed the motor is turning at using a centrifigul weight system. I don’t know that you’d want that in a machine tool (although you might), but it seems like it ought to be possible to replace the entrifigul mechanism with a manually adjustable system. For comparison a Bridgeport has a back gear and a vari-speed (variable pitch pulley) system. The back gear delivers 2 speed ranges: 60 to 500 rpm and 500 rpm to 4200 rpm. From this, we can see that the back gear has a range of 500/60 = 8.3:1–quite a stout back gear ratio! The vari-speed system provides a further 8:1 variability range. Meanwhile, because this was all done mechanically, the motor is free to run at all times at its designed rpm, ensuring that maximum power is being delivered to the spindle. paper by Reliance Electric, they can hold constant horsepower over a 2:1 speed range. If you have the cash for a fancy vector drive, you can expand that ratio to 4:1, which is why the big VMC makers like Haas use vector drives to run their spindles. If we add a go kart torque converter to our VFD only system, it has a 3:1 range. Let’s say that rather than running from say 100 to 3000 rpm on the motor, this lets us run the motor at 300 to 3000 rpm. At the bottom end we’re getting 3x as much torque as the VFD-only system. That seems a decent improvement. Of course the Bridgeport is generating 8x as much power at the lower end of its range, and the ranges are chosen to be an 8x spread of rpm for that reason so that the motor always delivers full power. For our example, 300 to 3000 rpm is a 10:1 range that the VFD has to span. Better than the original 30:1 range, but it means we may be looking at 1/10th the power at the bottom end. The trouble is the low end may be precisely where we want more power because we’re cutting some really tough material. Let’s say we add a Hi/Lo back gear system to our go kart vari-speed system. Further, let’s say we’re doing so for a 100 to 8000 rpm spindle range, such as we’re trying to design for this belt driven mill head. We have a motor that runs at 3000 rpm. With a 3:1 vari-speed, if we want to keep the Bridgeport ideal of max motor power throughout the range, we can allow a 3x variation. So, the top gear would run 2600 rpm to 8000 rpm, and the bottom gear would run 888 to 2600 rpm. Our back gear would be a matching 3:1 ratio. If we want to run more slowly than 888 rpm in low gear, we’re looking at running the range down further than the vari-speed can compensate for with the VFD. 100 = 1/8th, so we have 1/8th the horsepower available at the slowest speed. Given the VFD allows a 2:1 range, we may have more like 1/4 the horsepower. If we tried to cover that whole range without a back gear or vari-speed, we would be looking at 100/8000 = 1/80th the horsepower at the lowest speed! One issue that is going to develop from use of a vari-speed system is getting Mach 3 to understand what speed the spindle is really moving at. Imagine a system that mates a go kart “torque converter” to a VFD equipped motor. Let’s leave the centrifigul feature in place so that the torque multiplication at lower rpms is automatic. One wonders how repeatable speeds will be. Mach is built without a closed loop to a spindle tachometer, so the assumption is that response to a given Mach 3 voltage level will always produce the same rpm. There is a provision for a “pulley” setting to allow Mach 3 to take back gears and the like into account, but this is discrete and not continuously variable. This concept needs more thought and research, but some sort of back gearing mechanism or variable speed pulley seems a must for this project. 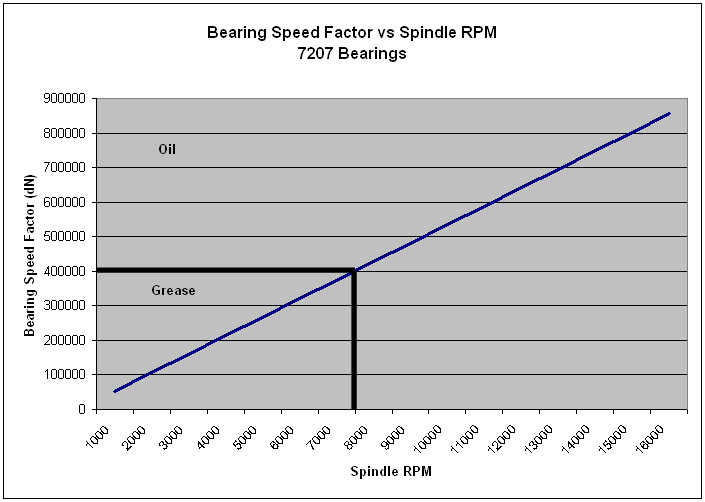 How Warm Should Spindle Bearings Run? see what other spindles are recommended to run at. Below are some references, but it looks like one should shoot for a range of 100 to 140 degrees F. Keep in mind that we want to avoid a thermal runaway situation where the heat expands the spindle, which creates more friction, more heat, more expansion, etc., etc. 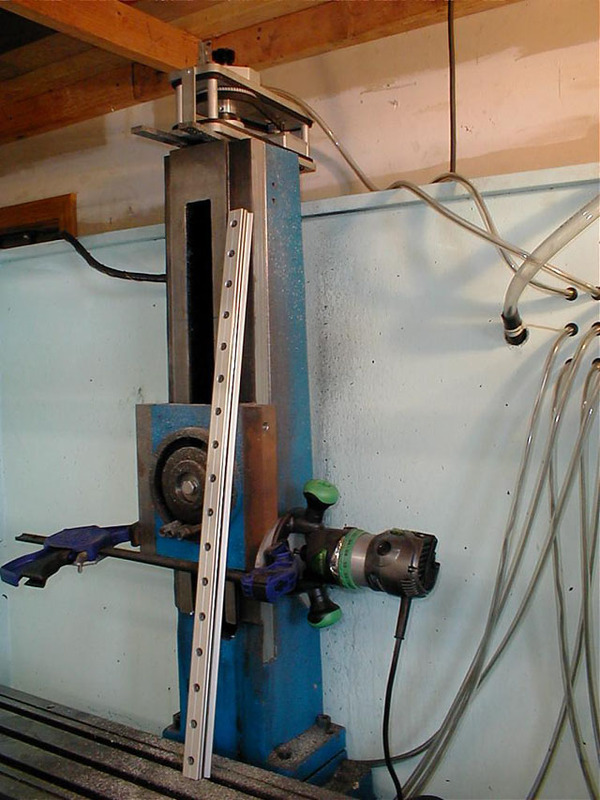 A CNC lathe spindle runs at 80 to 85 degrees F in this research paper. 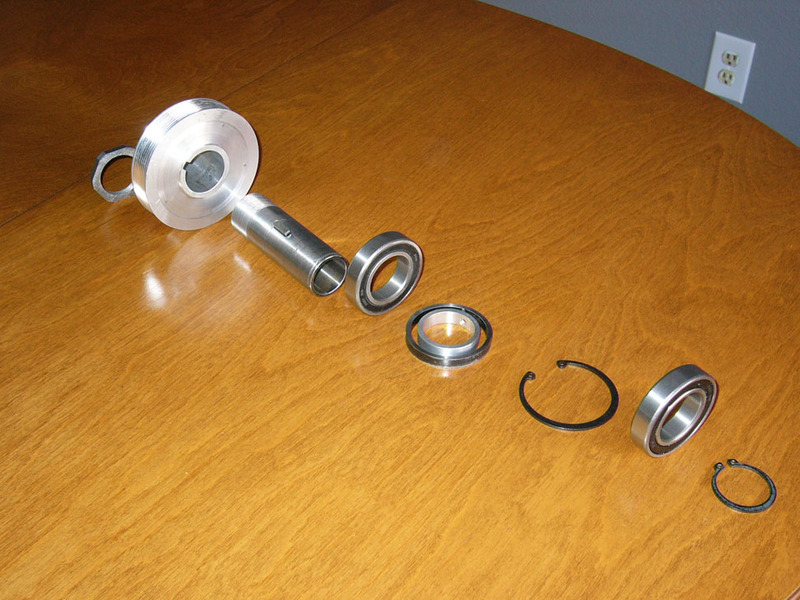 Setco spindles may operate at up to 140 degrees F as measured at the bearings. Excel Gear’s spindles are designed to run with the bearings at 110 degrees F or less. F. Timken’s published specs for tapered roller bearings, including bearing life specs, assume an operating temperature of 130 degrees F.
The belt speeder is designed to plug into your existing R8 taper and clamp around the quill. Internally, it uses timing belts and pulleys to multiply the speed of the spindle. A compact spindle cartridge to the right contains another R8 taper which will now be travelling at 2.5x whatever the main spindle is doing. You could define the timing pulleys to create larger ratios if desired. I just did a quick sketch after hearing Barry mention it to get an idea of what one might be like. given to getting it well clamped to the mill. a power drawbar arrangement there, I’ve sworn off hand wrenching drawbars for life since building my power drawbar! at either end). Need to consider thermal expansion when doing so. In the end of the day, I am still convinced a new mill head is the best bet for me, but for a lot of other folks, a removable spindle speeder may be a nicer idea. Certainly if you have a big mill like Barry’s Shizuoka CNC mill, it’s probably hard to consider building a new head for it. For more on the chuck, see the appropriate blog pages and search for “5C”. dN = N x (ID + OD) / 2 where N = spindle rpm, ID = bearing inner diameter, and OD = bearing outer diameter. What does this tell us? It gives us an idea of what kind of lubrication we need to consider. Assuming we get the preload correct for the bearings, we must still get the lubrication right or the bearings will overheat and fail. If we are even marginally off on preload, we’re going to need some safety margin on the lubrication front as well, so we don’t want to flirt with the theoretical maximums. the 7202 bearings that will be used for this spindle project. rpm (if you are feeling luck) would be a slam dunk for greased bearings. And that’s just where a lot of commercial knee mills wind up. Anyone researching the problem of building a spindle quickly discovers that the majority of cost and difficulty has to do with the bearings. Quality spindles benefit from angular contact bearings fitted in opposing configurations that maximize their axial and radial stiffness while providing as little turning resistance (and likely heating) as possible in the desired operating envelope. The traditional commercial approach to the problem is to fit two or more angular contact bearings to the spindle in matched duplex configuration and to use extremely accurate ABEC7 bearings. manufacturing cost, and also limit the applicability of the bearings so there are fewer available in the surplus markets. One does scare up the odd bargain, but it can’t be counted on. It has seemed to me that I can dispense with ABEC7. The difference in precision between ABEC7 and the next lower grade, which is ABEC5, is only 0.2 ten thousands of an inch of runout. For any concievable HSM project, this is not a meaningful difference, provided the rest of the operating parameters such as desired RPM range can be met by the lower precision bearings. What’s more difficult is the requirement for duplex bearings. Duplexing is the process of modifying a set of bearings by grinding the edge of either the inner and outer races so that when the bearings are butted up against one another, there is a precise gap. When the gap is eliminated, it results in a precise amount of preload being applied in a very controlled way to the interior of the bearings. This is simple, repeatable, and performs very well in commercial applications, but these matched pairs are much more expensive than individual angular contact bearings that do not have to be matched. With individual bearings, one can create the preload either using springs, or by fabricating a spacer that forces just the inner (or outer) races apart by an amount that is similar to the result of the duplex machining operation. I will leave the spring approach aside as I have doubts about its stability for a spindle application like this, but I will also readily admit it needs more research. The problem with the spacer approach is twofold. First, that spacer has to be accurately machined to very tight tolerances measured in tenths. Typically they would be ground, though it is possible also to do most of the work on a lathe. In any event, achieving these tolerances is hard in a home shop. Second, one does not know what the thickness of the spacer or shim needs to be to generate the optimal preload. 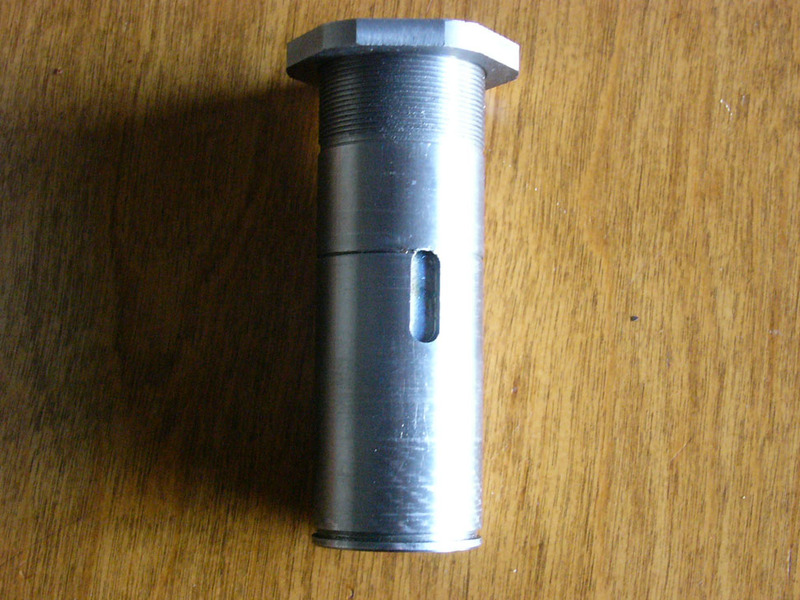 complete with shaft, and are separated by a precision spacer. The outer races are held by another piece of tooling (Gray/White) as well as by their press fit in the model spindle. will register on the lower bearing until the two races are in contact. At that point, further increases in force are passed through, so we need to look for the minimum force that will register on the test rig, and this will be the preload that is generated by the spacer between the bearings. A thinner spacer will result in less preload, while a thicker spacer results in more preload. It will be necessary to follow a test regimen that involves several spacers being tested until the appropriate preload is achieved. Unfortunately, we need to work our way from thinner to thicker spacers, which will necessitate making more than one spacer in order to perform the tests. In this way, it should be possible to create a desired preload by substituting some labor in this testing and in the creation of spacers for the purchase of more expensive duplex bearings. I note from a CNCZone thread that Misumi will sell you a custom bearing spacer for $7.00. I’d like to know more about the specs and tolerances, but that might be just the ticket to preload bearings. Fitting bearings is a ticklish business, both from the standpoint of the levels of accuracy required (measured in 10ths or 1/10,000 of an inch) and from the standpoint that the bearing is delicate, and the application of too much force while installing can ruin it, while too little force on the preload limits the accuracy and performance of the spindle. Clearly we’re talking just a couple of tenths of tolerances here! 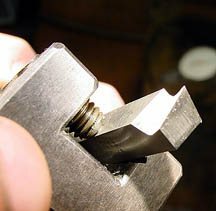 Swede comments that you can make cuts no greater than 0.004″ with the tool, but that by using your compound at an angle for infeed you can cut as little as 0.0002″ or less! That would be handy for sneaking up on tight dimensions. I have also heard of using reamers in floating holders (works great, but not sure about the 3″ size for these kind of bearings!) as well as using a special roller burnishing tool. The latter seems worth more investigation. If one wants to ream, Forrest Addy suggests boring to 0.005″ undersize at least for the first part of the hole before applying the reamer. mikes is that they can’t measure out of roundness–the error is spread over the three points. 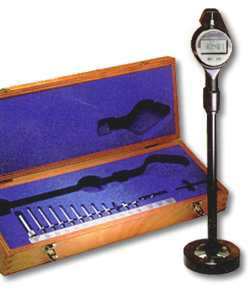 Your dial bore gage has to be calibrated for maximum accuracy as you are using it. The recommendation there is to calibrate it with gage blocks. You stack them to get to the measurement you are looking for, but a top and bottom on the stack, and then measure that distance with the dial bore gage. The last comment I will make on this is that NSK suggests a dial bore gage be used to check fits in their Super Precision Machine Tool Bearing Catalog. They note that it is important to check that the temperature of the components all be the same, an important tip when measuring to tenths! Another interesting alternative is the use of pin gages. Marv Klotz has a piece of software called “PLUG” that will figure how to use 3 pins to measure 1 larger hole. Evan amplifies on this by saying he makesspecial plug gages. They taper 0.001″ per inch and he just measures how far they will go in and then use a little math to figure the hole size. to let the gage tips move in without excessive force. or rectangular block simplifies the task of mounting the spindle cartridge to the case considerably. For what it’s worth, the Setco cartridge spindles run with two angular contact bearings up front and two roller bearings in back. The angular contact bearings are duplex but are not in contact, and are separated from one another by an inch or two, and are run in a “DB” (back to back) orientation, not “DF”. They offer an optional 3 bearing nose system for even more rigidity. 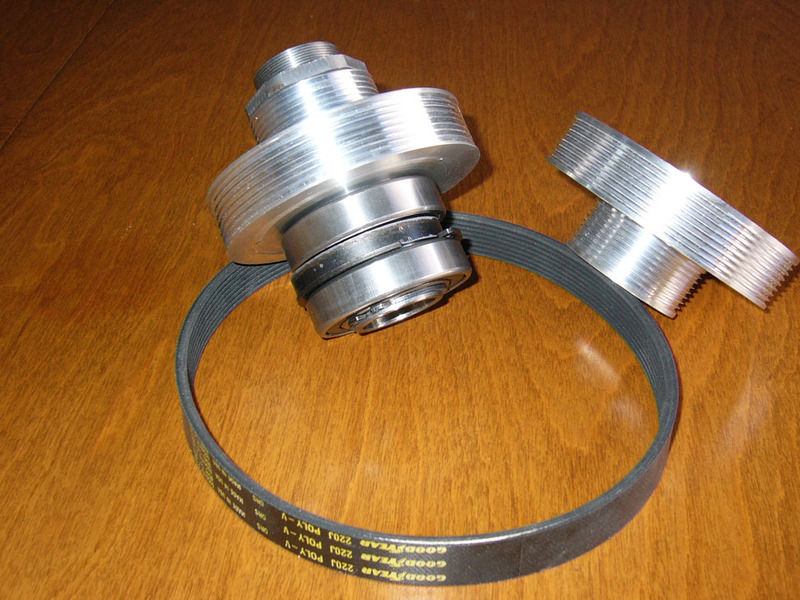 The design accomodates swap in of the additional bearing simply by installing a new, shorter spacer between the original two, which creates a DT-DB combination. Yet another swap also a quad DT-DB combination to be installed for even higher performance. 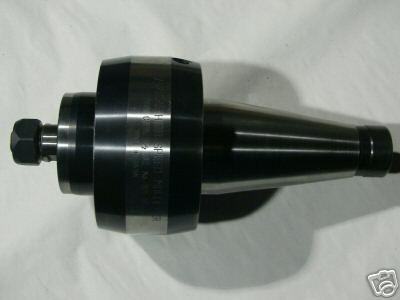 Their F040-030M model is an NMTB #30 taper spindle cartridge. 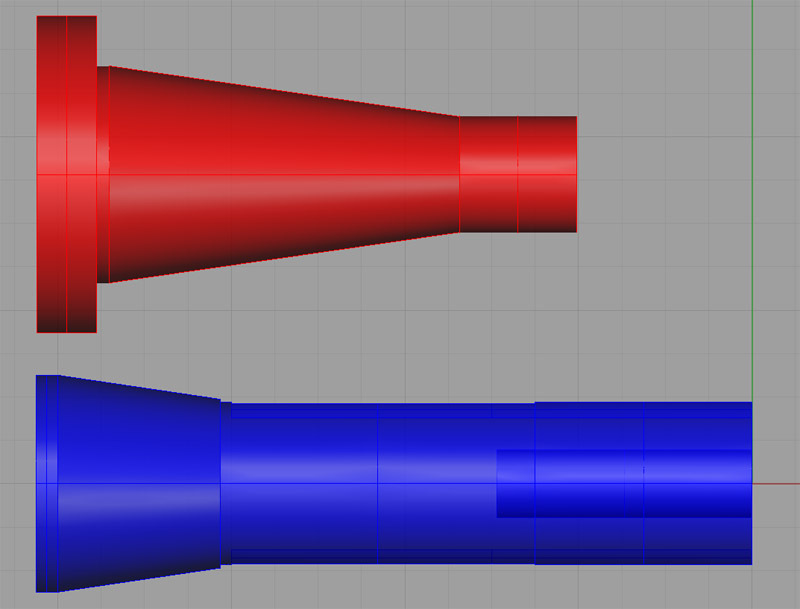 Here are some quick sketches in Rhino 3D of the mill head. It is based on a 3 bearing design, with the duplex ABEC 7 7207CTDULP4‘s at the bottom and an ABEC 3 7206 BEP at top. 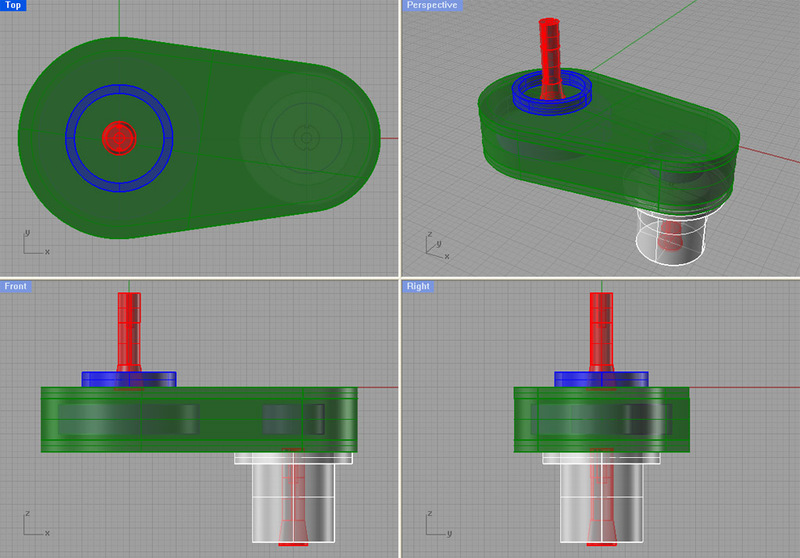 I really think the duplexed bearings that surround the toolholder will add tremendous rigidity. This design is based on a couple of off-the-shelf timing pulleys, and on the Leeson 192074 motor upgrade that Aaron recommends and that is sitting in my garage as we speak. Based on a top speed of 3000 rpm from that motor, and the 2.4:1 ratio’d set of pulleys, this yields a top spindle speed of 7200 rpm, which is right what I am shooting at. McMaster Carr also lists one larger pulley size, and these sketches will accomodate that pulley as well. 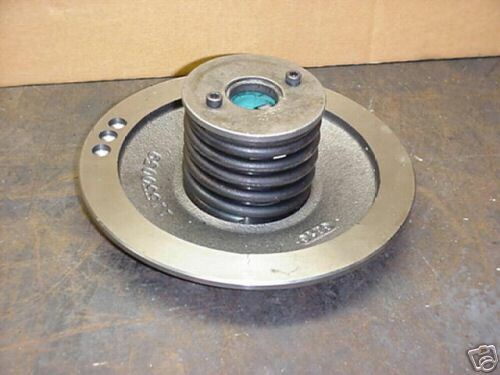 If one uses such a pulley, a spindle speed of 9000 rpm would be generated at the top end. That seemed a bit much for me, but the pulley is not that expensive to order and experiment with. There is a lot that is not considered by the sketches. For example, how do you go about changing the timing belts or adjusting their tension? 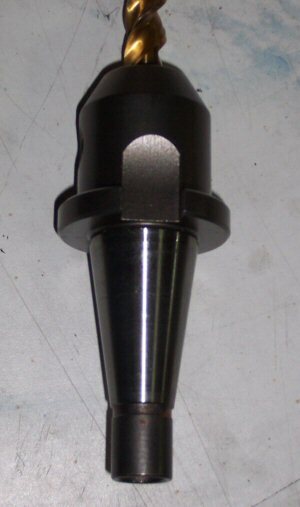 The exact mechanism by which the cartridge spindle is clamped in place and aligned for precision and rigidity is not detailed here. I’m wondering if a split clamp arrangement like what one finds on engine crankshaft bearings wouldn’t work. Yet another issue is how the bearings will be protected from swarf and coolant. This is not detailed. One thought I have is whether to feed compressed air to the spindle cartridge. This would have two benefits. First, there is a cooling benefit. 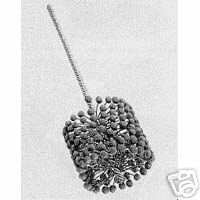 Second, it would provide a positive pressure system that would help blow swarf back out of the spindle. Ideally it would be arranged so the air only flows while the motor is running, by using a solenoid valve in the air line. Cosmetics could be greatly improved with judicious chamfering and rounding of edges, and I have not specified fasteners at all. I need to make sure there is the potential for thermal expansion without damaging the bearings. The list goes on. It’s a sketch, not a finished design! Materials are pretty straightforward. 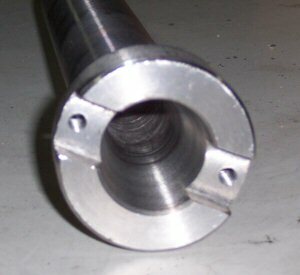 The spindle cartridge is 3 1/2″ OD x 5/8″ wall thickness steel DOM tubing. 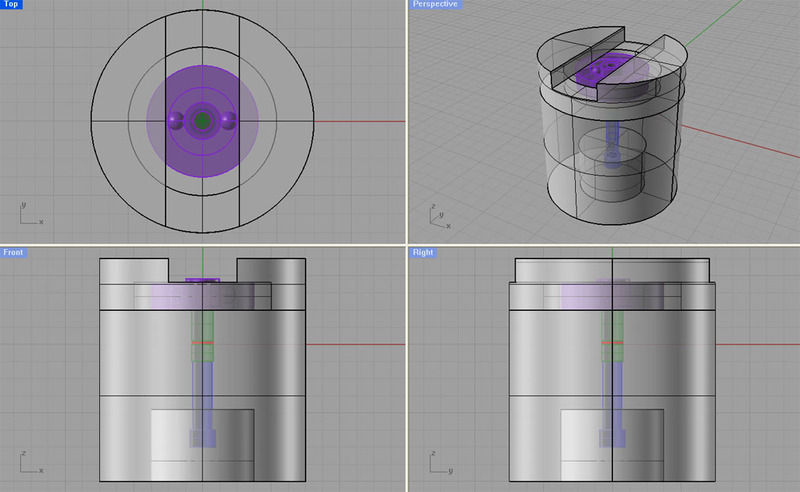 I’ve checked and it can be machined to the specs desired for the bearings. The rest of the mill head is made from 1″ aluminum plate. 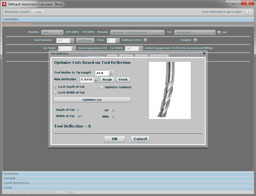 Ideally one should do a Finite Elements Analysis to optimize and quantify the design. Perhaps someone on one of the web sites will offer to take a 3D model from me and perform that analysis. It is tempting to fill the big chamber behind the spindle cartridge with concrete in order to further dampen any vibration in the head. With all of the aluminum, it seems unlikely this will make the head much heavier than the stock gear drive head. One last thought is that the IH spindle clearly protrudes considerably above the top of the head. This is due to elimination of a quill. It would be my thought to cut this off and fit a shortened drawbar with power changer up there. (very good!) is Bearings Direct, which will sell a matched pair of 7207CTDULP4 for $347.89. This would provide a significant step up in rigidity for this mill. 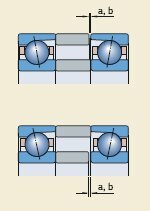 Given that I plan on machining a new head to house the spindle, it would be straightforward to make provision for a duplex pair. It’s mighty tempting, I have to say! at 3 different Asian mills, they were all using deep groove ball bearings and not angular contact bearings. He chose to use that as an excuse to save the cost of the expensive AC bearings. I choose to look at it as reason to believe the performance with a nice set of bearings could be a lot better than the old mill head. New #30 Taper Mill Spindle Came Today! I got the spindle from Industrial Hobbies and the bearings from McMaster-Carr. Nice combo. The finish on the spindle is nicer than what IH pictures on their web site. Now I’m champing at the bit to turn it into a mill head! Just have to wait until I finish my other projects though. I need to research carefully how the bearings needed to be fitted to both the spindle and the bores in the mill head I will fabricate. The bearings are SKF’s, a 7206 and 7207 angular contacts. Their specs indicate a pretty high speed is possible, so hopefully my goal of 6000-8000 rpm will be doable. I should think so in this application which is pretty lightweight. Building the mill head will largely be a matter of fabricating a box. I need to build a box that will properly house the spindle, bolt to the existing dovetail assembly that the current head bolts to, and that will be nice and rigid. I’m thinking of making it out of some pretty substantial aluminum, perhaps some 1″ thick stock or even thicker at top and bottom. I’m thinking of aluminum because it doesn’t have the problem of internal stresses moving it after it is machined, so it will stay true. While I’m at it, I think I’ll set up this head so it gets trammed in once, and then stays put. There’s no need to have a swivel head on a CNC machine, as well as no need for a quill which just reduces the accuracy and rigidity of the head anyway. 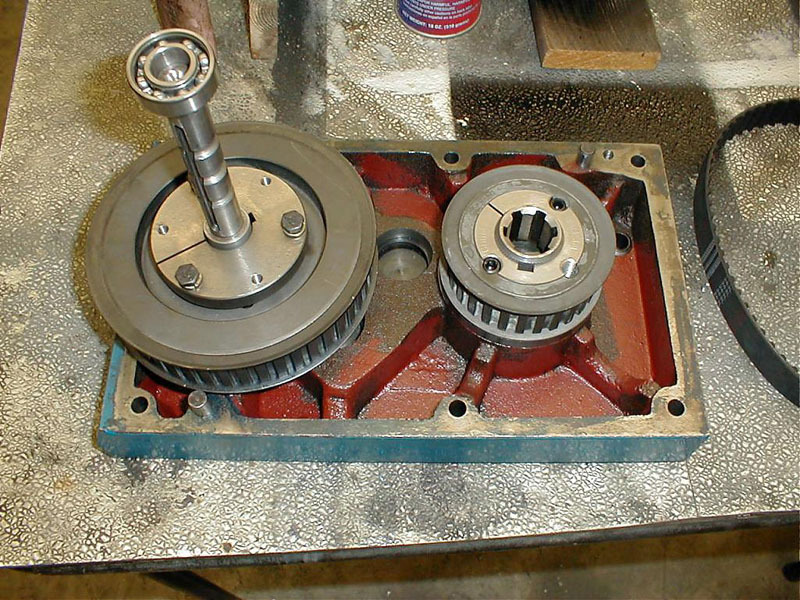 By taking this approach, I also avoid having to turn down the shaft of my larger motor to fit the IH gearhead. I can just specify a pulley for the timing belt that fits the motor as is. 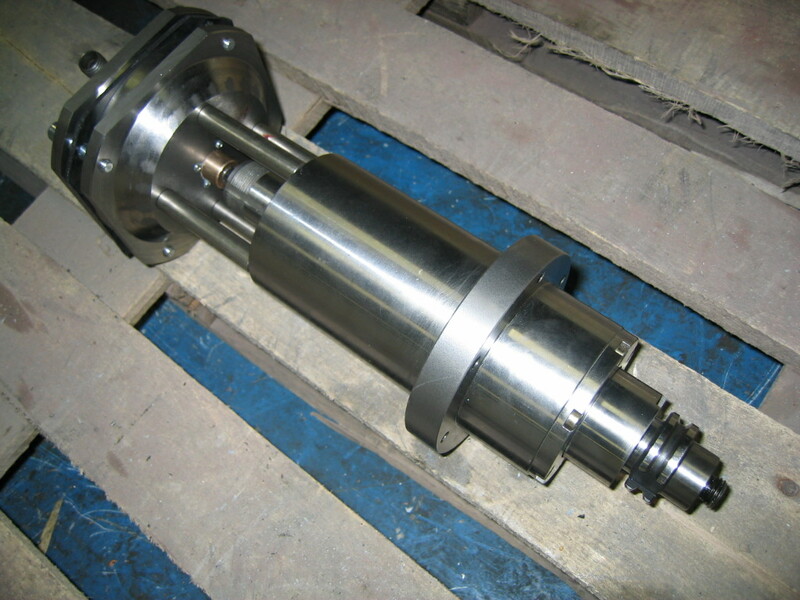 NMTB 30 Spindle for the IH Mill! Industrial Hobbies is having a going out of business sale, and one of the things they are offering is an ISO 30 or NMTB 30 spindle for the IH Mill. At $65, how could I resist? This is a better spindle taper than the classic Bridgeport R8, and is really the preferred taper for building a toolchanger for this mill. Aaron also recommended a set of angular contact bearings from McMaster-Carr that cost another $100, so I ordered those too. What I’d really like to do is take these goodies and create a belt driven head for my mill that’s capable of higher rpm’s than the current geared head. The more rpm’s the merrier so far as I am concerned. I can always use a VFD to cut down on the rpm’s if need be. Anyway, this will be one of those very long term projects. I had to act now to get my hands on one as they were in limited supply and he is going out of business. We’ll see what comes of it. Addy writes about AC bearings and milling machine spindles.